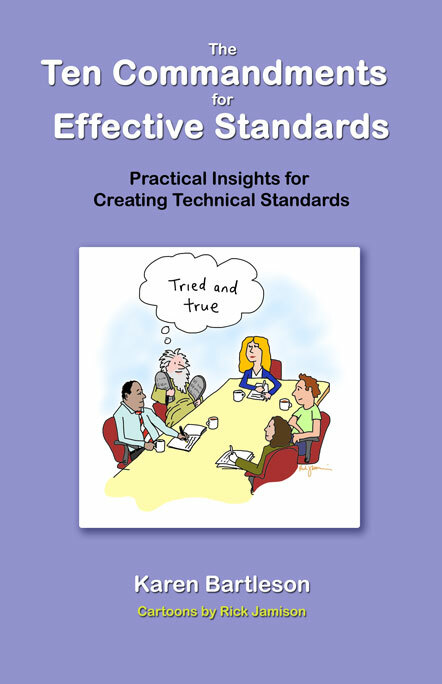 Ten Commandments for Effective Standards �what works and what doesn�t when developing effective technical standards. Chapter 2: Why "Effective" Standards? Chapter 13: Go Forth and Standardize! But do you know what it takes to create an "effective" standard? 'The Ten Commandments for Effective Standards,' written by computer chip industry veteran Karen Bartleson and illustrated by corporate cartoonist Rick Jamison, will not only provide you with ideas for creating better standards, it will also provide you with a newfound understanding of standards and their importance, respect for the standardization process, and ways you can leverage others' industry expertise to help you succeed in creating more effective technical standards. Based upon twenty years of experience in the area of standards for electronic design automation and ideas drawn from other industry experts, 'The Ten Commandments for Effective Standards' provides you with a list of procedural imperatives about what works and what doesn’t work when developing effective technical standards. This book will teach you how applying Bartleson's commandments to day-to-day standards activities can help make your resulting standards more effective and easier to adopt. From the Golden Rule of effective standards -- "cooperate on standards, compete on products" -- which points to the essence of standardization, to the tenth commandment -- "know that standards have technical and business aspects" -- which declares the importance of a standard's commercial implications, this book will provide you with a foundation for preparing for and performing in the technical standards arena. Whether you are already involved in the process of creating technical standards or are interested in learning more about it, Bartleson's 'The Ten Commandments for Effective Standards' is standard reading for anyone pursuing knowledge, excellence, and success in the field of technical standards. Read more at Pradeep's Point blog. Karen Bartleson has three decades� experience in the computer chip industry. She is known for her work in the area of standards for electronic design automation. Bartleson is also one the pioneers into social media in her industry, including Twitter. She is the author of The Standards Game, a blog focused on the standards arena. Rick Jamison is a rare entity in the corporate world. By day, he's disguised as the mild-mannered Social Media Strategist at Synopsys. But at sundown, he reveals his real superpower as a corporate cartoonist. Part illustrator, part subject clarifier, and part Big Business underbelly tickler, his cartoons enlighten, enliven, enrich, and entertain.